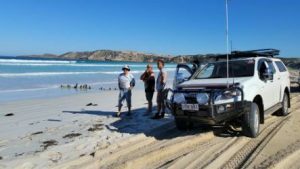 You should have come to Coffin Bay …what an adventure! 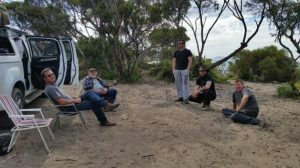 We all made our own exciting way to Coffin Bay on Friday, 27 April 2018 and stayed at the Coffin Bay Caravan Park. Once we all got settled with ventured over to the Yacht Club for dinner. Great venue overlooking the marina and as it so happened it was Grant’s (our trip leader) and my birthdays! We both found out that we are the same age but that’s a secret. After dinner Grant and I had dessert to which was added a birthday candle. A little birthday sing-song and then we all made our way back to the Caravan Park to watch the footy, with most of us retiring early, as we were not keen to listen to the end result. 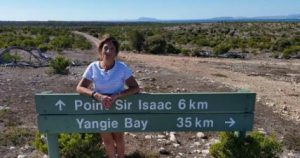 We left the Caravan Park at around 8.00am and headed off to our destination, which was Port Sir Isaac in the Coffin Bay National Park. 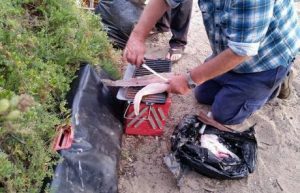 After setting up camp, we then walked straight down to the beach to catch fish; and catch fish we did. I would have to say the Stuart and Rose, by far, caught the most fish with Rose the outstanding winner! The weather was picture perfect, the ocean simply stunning and the walks (wow) they were just enchanting. For those that don’t know me – I love to walk for endless miles for no other reason than to look at the scenery and enjoy the stillness. All of us caught a fish at some stage. 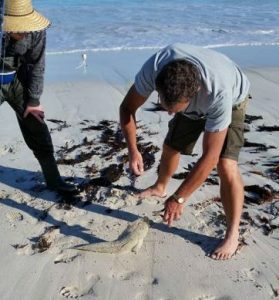 Greg caught his first flathead and I actually caught my first ever fish which was a whiting. I have never even heard of some of the fish that Rose caught. After a day out fishing, we sat around our imaginary bon fire! The fire ban season for the region was extended for a week, which meant no fire and no warmth, however that didn’t stop the banter between the seasoned travellers and the newbies. I had so many clothes on, I felt like the Michelin Lady! 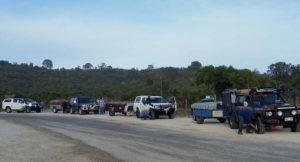 The weather forecast predicted rain and stormy weather on Wednesday afternoon so the team decided to abandon camp. We packed and headed for home, which was not as easy as it sounds. The tide came in and the roads became flooded – lets just say that what took us approximately 3 hours to get to camp, took us a good 6 hours to get out. That all said, I don’t believe that I/we even touched the surface of this gorgeous National Park. 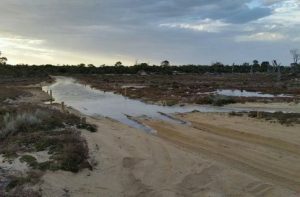 So many 4WD drive tracks, so many more fishing bays to fish off and so many endless walks into nothingness. It was indeed a very magical place and I think we all agreed that we would all be back someday! Big thanks to Grant for being a fabulous trip leader and to all the men folk that allowed Rose and me to gate crash the boys fishing trip!